Death toll in India after the quake rises to 62-46 in Bihar, 13 in UP, 2 in West Bengal and one in Rajasthan:Foreign Secretary. Rains and fresh tremors tonight added misery in Nepal hampering rescuers from wading through tonnes of rubble of flattened homes and buildings to look for survivors of the earthquake that has killed over 2,500 people, including five Indians, and left more than 6,000 others injured. With no electricity, Kathmandu, the capital of Nepal, looked a ghost town with rains pounding the city, forcing the closure of the airport where chaotic scenes were witnessed with stranded foreign tourists desperate to go home. “Still raining, adds to the misery. Only consolation is that it may ease the water crisis in some of the shelters,” Nepali Times Editor Kunda Dixit tweeted. Nepal authorities said Sunday that at least 2,430 people in that country had died in Nepal alone, not including the 18 people that the Nepal Mountaineering Association says died in an earthquake-triggered avalanche on Mount Everest. Another 61 people died from the quake in India and a few in other neighboring countries. Stepping up relief and rescue operations in quake-hit Nepal, India today deployed over two dozen aircraft and choppers along with nearly 1000 trained personnel and said the situation in the Himalayan nation was “very, very serious”. A slew of steps have been taken for speedy evacuation of stranded tourists including goodwill visas to foreigners and mobilising of buses and ambulances to bring them by road. Over 1,000 people have been flown from there since yesterday. 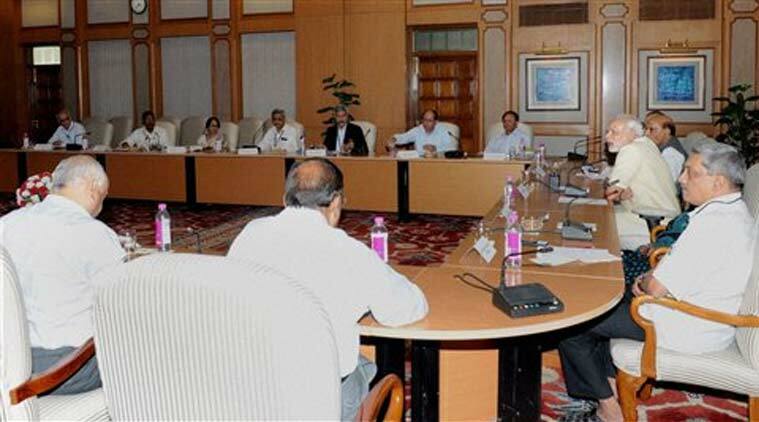 Earlier, Prime Minister Narendra Modi held a meeting to review the situation in the quake-hit Nepal where death toll has crossed 22,00 mark. Modi has directed speeding up of efforts to save and evacuate people from Nepal. Meanwhile, weather department has predicted widespread rains and thundershowers in Nepal which may trigger landslides. The IMD has asked asked people to remain alert. activity over Nepal during next the 4 hours. “The activity is most likely to become widespread on April 27 and 28 with the possibility of isolated heavy thunderstorm activity, particularly over eastern part of Nepal,” the Ministry of Earth Science said in a release. A powerful, magnitude 6.7 aftershock has shaken the Kathmandu area of Nepal a day after the massive earthquake devastated the region, sending people yelling and running for open ground. Tremors were felt in most parts of north and northeast India including Kolkata, Siliguri and Assam. Minutes after the first aftershock, Nepal felt another measuring 5.0 in magnitude. The US Geological Survey says the aftershock on Sunday registered at a shallow depth of 10 kilometers (6 miles). 1,910 people were killed in Nepal, at least 57 in India, 17 in Tibet and two in Bangladesh. Two Chinese citizens died at the Nepal-China border. 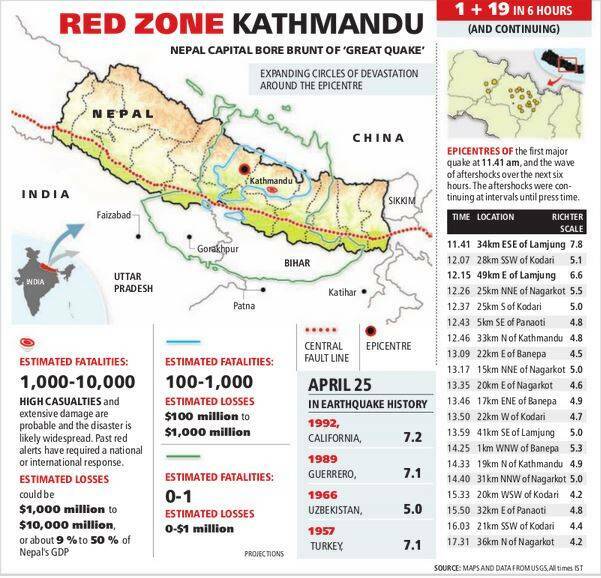 The earthquake hit a heavily populated area of Nepal, including the capital, Kathmandu, and its impact spread far beyond the Kathmandu Valley. Strong aftershocks were felt as late as Sunday morning. Local hospitals are rapidly filling with injured residents, and Kathmandu’s international airport remains shut. India was quick to come to Nepal’s aid with four IAF transport aircraft carrying about 10 National Disaster Relief Force (NDRF) teams, totalling 450 personnel, reaching Nepal on Saturday evening. Prime Minister Narendra Modi spoke on the phone with President Ram Baran Yadav and assured all the help required. 9:06 pm Army’s Gajaraj Corps and Indian Air Force (IAF), Tezpur, have activated disaster management mechanism for providing medical relief to people in earthquake-hit Nepal. 8:25 pm Prime Minister Sushil Koirala has appealed to Nepalese people to donate blood as hospitals badly needed it to treat more than 6,000 people injured in the killer quake. 7:38 pm Chief Minister Vasundhara Raje announced that 10,000 relief kits including food packets, plastic sheets, medicines, torches, water bottles and blankets will be sent to Nepal. 6:56 pm India deploys 35 buses to move its stranded nationals out of Nepal via two road routes -through Sunauli in UP and Raxaul in Bihar: Foreign Secretary. 6:55 pm Senior-level inter-ministerial team to go to Nepal: Foreign Secretary. 6:45 pm Death toll in India after the quake rises to 62-46 in Bihar, 13 in UP, 2 in West Bengal and one in Rajasthan:Foreign Secretary. 6:34 pm 13 military and 3 civilian aircraft from India to operate to Nepal. 5 military planes lands in Kathmandu: FS S Jaishankar. 6:19 pm We expect to have 13 military aircraft going to Kathmandu today: Foreign Secretary S Jaishankar speaks on the rescue operations in Nepal. 6:07 pm Nepal quake: Prime Minister Narendra Modi takes stock of situation, directs speeding up of efforts to save and evacuate people from Nepal. 4.35 pm: A total of 311 pilgrims and tourists from Tamil Nadu are stranded in quake hit Nepal and efforts have been taken to ensure their safe return, besides setting up help desks, the state government said on Sunday. Relatives of those in Nepal may contact help desks in Tamil Nadu House in Delhi through 011-21493460, 011-24193456. #NepalEarthquake A C-17 Globemaster III aircraft with about 285 passengers on board is scheduled to arrive at Palam, Delhi, at 4.45 PM. 4.15 pm: The Health Ministry on Sunday rushed a 34-member medical team along with 15 tonnes of medical supplies to Nepal. “The team consists of 10 Orthopaedic Surgeons, 4 Anaesthetists, 12 Male Nurses and eight OT Technicians to the earthquake affected areas of Nepal to provide emergency medical relief,” the Health Ministry said. The team left for Nepal in an Air Force plane, officials said. 4.00 pm: Noted sand artist Sudarsan Pattnaik has created a sculpture with an aim of spreading awareness among people about the need to help those hit by the calamity. 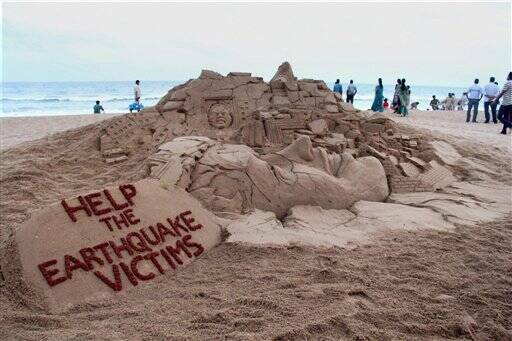 The sand sculpture with a message “Help the earthquake victims” was created at the Puri beach in Odisha. 3.47 pm: China, Australia, Japan, New Zealand are also trying to locate their citizens in Nepal. According to an AFP report, China said it is chartering flights to pick up 683 tourists that were in the country. in the Nepal, while New Zealand’s Foreign Minister Murray McCully said more than 110 nationals had been accounted for. Japan’s foreign ministry said it has set up a liaison office to help locate the 1,100 of its nationals who were staying in Nepal when the quake hit, Jiji news agency reported. 3.40 pm: People from Karnataka who were stranded in Nepal after the earthquake have started arriving in India in batches. A batch of 82 people belonging to Karnataka has reached Delhi in an IAF aircraft, the Secretary, Disaster Management said in a release. Officials said 35 people from Haralahalli in Mandya District are on their way to Gorakpur and added that another batch of 30 people from Belagavi are also on their way to the Indian border. 3.10 pm: Nepal death tolls crosses 2200, reports Reuters. The report points out that rescuers dug with their bare hands and bodies piled up in Nepal and that the fresh aftershocks triggered another avalanche on Mount Everest. 2.50 pm All relief operations headed to Kathmandu have been kept on hold till 4 PM today due to fresh tremors in Nepal, according to the Defence Ministry, reports PTI. So far 1910 people have been killed in the Nepal earthquake disaster, says Associated Press. India plans to fly at least 10 aircraft today to Nepal carrying special equipment, medicines, water and personnel. IndiGo, SpiceJet flights do not land in Kathmandu and return as ATC personnel at airport there evacuated following aftershocks. Air relief operations to Kathmandu kept on hold till 1600 hours due to fresh tremors in Nepal, says Defence Ministry. 1.00 PM: Indian climber in Himalayas near Mt Everest reports aftershock and avalanche. 12.00 pm: The first rescue plane carrying people injured in an avalanche at the Everest base camp arrived in Kathmandu on Sunday carrying 15 climbers who survived the collapse triggered by Nepal’s worst earthquake in 81 years. 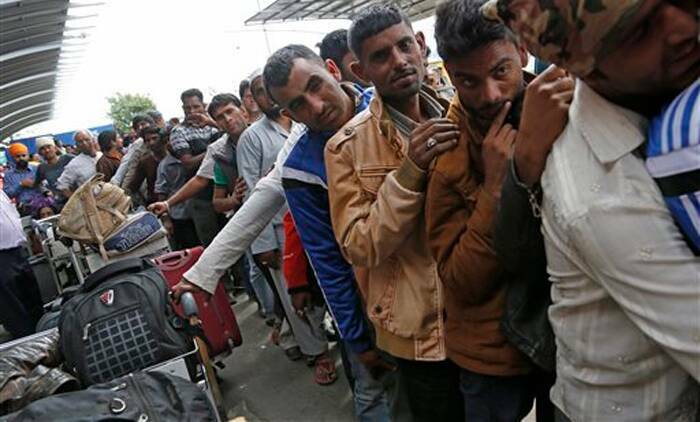 11.45 am: Planeloads of aid material, doctors and relief workers from neighboring countries began arriving Sunday in Nepal. 10.20 am: Govt announces compensation of Rs. 2 lakh to families of those who lost their lives in the quake across parts of India. 10.00 am: Two tremors measuring 5.6 on the Richter scale shook parts of India and Nepal late last night and early today but government gave an assurance that there was no cause for panic as these were aftershocks. 9. 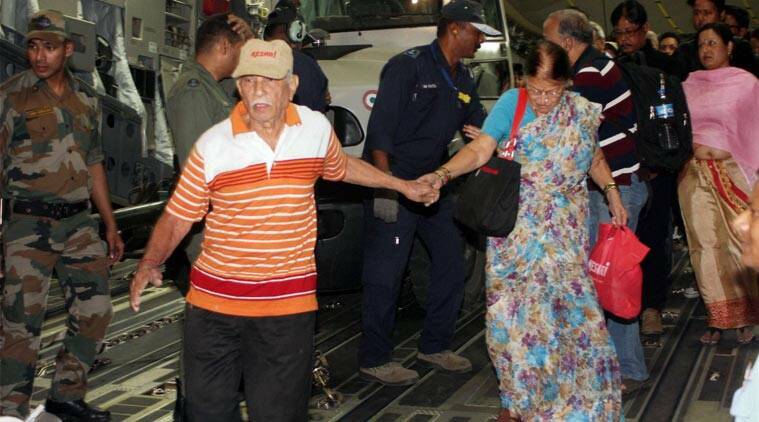 50 am: Nearly 550 Indians have been evacuated by the IAF from quake-hit Nepal even as India stepped up its relief and rescue mission with 10 flights and 12 helicopters scheduled to carry specialists and equipment to Kathmandu today. 9.45 am: Here is an interactive map with details of death toll due to the Nepal quake. 8.04 am: A 62-member search and rescue team has left for Nepal to carry out humanitarian rescue there. 8.00 am: More than 1,800 people killed in Nepal, at least 51 were killed in India, 17 in Tibet and two in Bangladesh.